The government will soon constitute the Fifteenth Finance Commission, as per normal practice, a couple of years before the end of the five-year period during which the Commission’s recommendations are valid. Article 280 of the Constitution requires that a Finance Commission be constituted to recommend the distribution of the net proceeds of taxes between the Centre and states, and among the states. The framers of the Constitution were seeking to address the vertical imbalance between the taxation powers and expenditure and responsibilities of the federal government and the states, and the horizontal imbalance, or inequality, between states that were at different stages of development. Ensuring inclusiveness is, therefore, a key mandate of the Finance Commission. That means assigning weights to things like population, the fiscal distance between the top ranked states and the others, etc. It is not that the best-performing state will be allocated the highest share — even if delivery execution and governance are better — rather, the effort will be to narrow the development gap between states. Much has changed since the First Commission was set up in November 1951 under the Chairmanship of K C Neogy, a former member of the Constituent Assembly and diwan of a princely state. The President has appointed 13 more Commissions since then. The Finance Commission Rules, 1951, lay down the criteria for being members of the constitutional body: those having special knowledge of finance and accounts of government with wide knowledge and experience in financial matters and in administration, or with special knowledge of economics, and those who have been qualified to be appointed as a judge of a High Court. 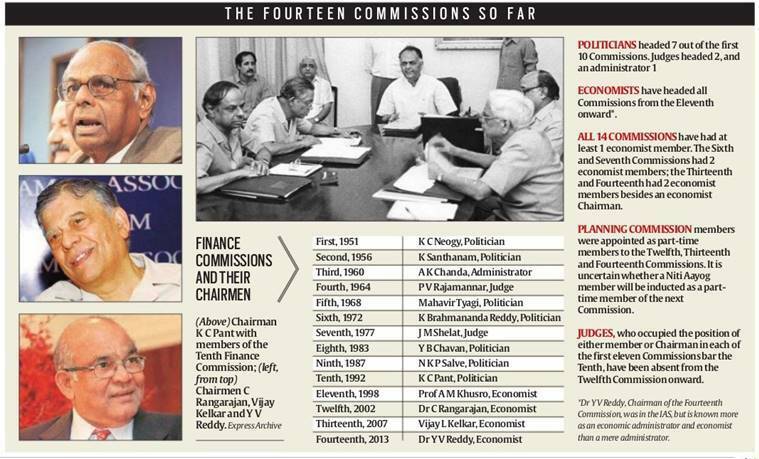 In the years following the reforms of the 1990s, Commissions have been headed by reputed economists and administrators — from A M Khusro, who headed the Eleventh Finance Commission, to Chakravarthi Rangarajan, Vijay Kelkar, and Y V Reddy, who were Chairmen of subsequent Commissions. Senior politicians like K Brahmananda Reddy, Y B Chavan and N K P Salve had helmed earlier Commissions; the last politician in this role was K C Pant, who then went on to be Deputy Chairman of the Planning Commission. The approach the government adopts on the composition of the Fifteenth Finance Commission — and whether it will follow what has been a convention, since the Twelfth Finance Commission (2002), of having a member of the (erstwhile) Planning Commission as a part-time member — will be interesting to watch. The Planning Commission in its old structure and form has been dismantled, and has been replaced with the Niti Aayog. Rangarajan, who headed the Twelfth Commission, had suggested to the government that it could alternate between an economist and a political figure such as a former state Finance Minister to be the Chairman. What has also changed dramatically since the 1950s, when the First Commission presented its recommendations on the transfer of resources between the Centre and the states, is the scale of distribution of tax proceeds. From 10% of the total tax receipts of the Centre in 1950, it has now risen to a record 42% after the recommendations of the Fourteenth Finance Commission headed by Reddy — a share that makes previous awards look conservative, and sits well with the spirit of cooperative federalism. Along with these changes has been the widening of the terms of reference of the Commission — the Thirteenth Commission was told to assess the impact of the proposed GST from April 1, 2010 and the need to improve the quality of public expenditure, to review the finances of both the Centre and the states, to suggest measures to maintain a stable fiscal environment consistent with equitable growth, and to suggest a revised roadmap to maintain the gains of fiscal consolidation through 2015. The other significant change has been in the equation between the central and state governments as a result of the recommendations of the Twelfth Finance Commission which reshaped lending by the federal government to states. Rather than the Centre borrowing and then lending to states, it recommended that states be allowed to borrow directly. Since then, the debt obligation of states to the Centre has come down significantly, giving rise to questions over whether states that have repaid all borrowings from the Centre need to take Delhi’s approval at all for their future borrowings. That Commission headed by Rangarajan also recommended that if states were to be given debt relief over and above the distribution of tax proceeds, conditions of fiscal discipline should be enforced. Grants that were recommended by the Commission are however conditional — which may also have been criticised, but the counter-argument has been that it was aimed ultimately at improving governance. It has also been pointed out that other federal structures too have equalisation grants. The Fourteenth Commission recommended the creation of a Fiscal Council; the Thirteenth had set out detailed measures on implementing GST with a grand bargain for states. As the Fifteenth Commission is set to be appointed, the criteria for distribution will be reviewed. Will it take into account the level of collections by each state after the roll out of the GST? The challenge this time will be the fact that unlike in the past, the share of net tax proceeds between the central government and states is almost equal. After the last Commission’s recommendation to distribute 42%, raising the bar on higher transfer of resources will have a much bigger impact on the federal government. Rangarajan had suggested that it was time now to perhaps look at a Constitutional amendment to fix a ceiling on the distribution of the net tax proceeds, with the Finance Commission arbitrating on distributing tax proceeds among states. There has just been perhaps one case of a dissent note being accepted in the recommendations of the Commission; in general, the boat has not been rocked. The Commission itself reckons that its biggest role has been to uphold the country’s federal structure, and to be an architect of fiscal restructuring — from being mainly an arbitrator between the Centre and states. 2 Debate over ‘therapeutic food’: can it solve the malnutrition problem? 3 Tweaking genes to fight cancer: how does it work?